I’m a big fan of Stanford professor Carol Dweck’s Growth Mindset. It’s hard not to be. It’s evidence-based research that, in its most basic form, tells us that if a student tries hard and believes he can do it, i.e. has a growth mindset, he will succeed if he keeps at it. Conversely, if he has a fixed mindset, i.e. believes he was genetically preordained to succeed (or not), chances are that no matter what his gifts and talents, over time he will grow to fear failure, stop taking risks, and not live up to his full potential. Some of the most encouraging findings around growth mindset are that adults have HUGE influence in helping kids develop a growth mindset and it’s NEVER TOO LATE. No wonder that schools are eager to embrace the lessons of growth mindset. They are doing everything from measuring it with questionnaires, teaching it as a part of the curriculum, and re-training adults to speak to children in ways that will nurture a growth mindset. It’s only with over-simplification of the research that we have some hesitation. Even Carol Dweck agrees. As with anything that has great rewards, it’s just not that easy to teach kids to stop saying, “I can’t do it” and start saying, “I can’t do it, yet” and expect dramatic improvement. But please don’t stop reading, yet. We can do this. It’s just going to take some hard work. So if you have a growth mindset, keep reading. Every great teacher knows that you use the curriculum as a foundation, but it’s how you modify it for every class and every student that makes the difference between learning for all and learning for a few. Growth mindset is no different. Truly instilling growth mindset requires specificity. 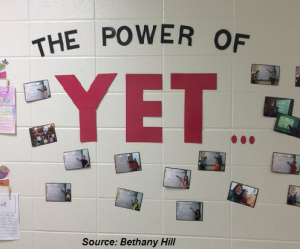 Because most kids, most of the time, even if they have a growth mindset, aren’t quite sure what to do when they get to the “yet”. Quoting the master Dweck herself, “Studies show that people are terrible at estimating their abilities.” While some students will certainly figure it out with trial-and-error, we are leaving it to chance for others to have one too many failures, get discouraged, and, well, have a fixed mindset. Part of teaching growth mindset, therefore, requires that we use language that takes into account specific and objective information about each child’s past accomplishments, strengths and needs, so each child learns how to be successful and recover from setbacks in the way that works best for him. Since growth mindset is best taught by example, here are some examples of what we mean. To be clear, Fixed Mindset language = BAD. Growth Mindset = GOOD. 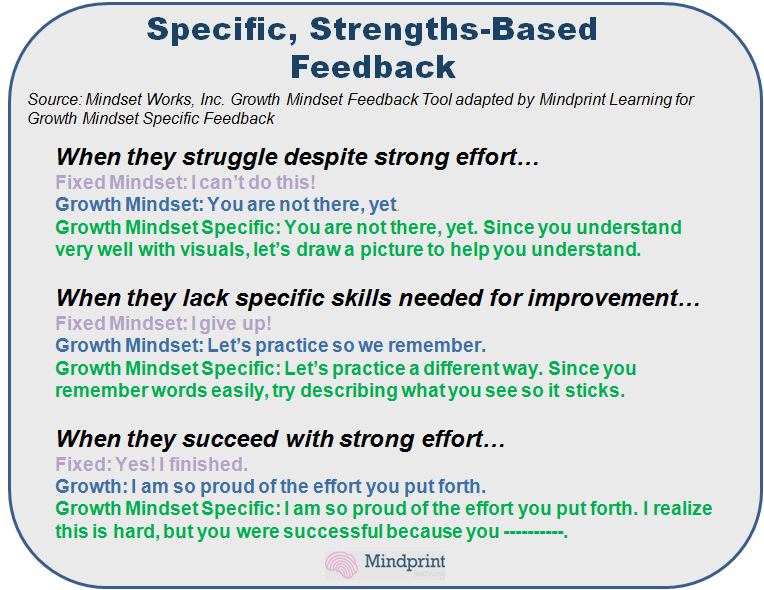 Mindprint’s modified Specific & Strengths-Based Feedback = AWESOME. How you get to Mindprint’s Growth Mindset Specific & Strengths-based Feedback depends on what you know about each student through parent and teacher observation, past academic performance, test scores and, if you’re lucky enough to have it, observation by a trained psychologist or a unique learning profile from Mindprint. Whatever you do to get there, when you get there, you will see it will be well worth the effort. Learn more about growth mindset, grit, and student motivation. Will you be attending AMLE? Come hear Mindprint speak about metacognition & growth mindset for middle schoolers. We hope your school year is off to a wonderful start. Please check your Mindprint Toolbox to be sure your students have all the organizational strategies they need to make this a great year.